In my life, few things are certain. Jesus is my best friend. 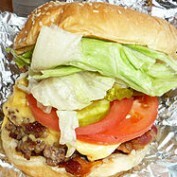 That is a burger from five guys in my profile picture. Please read some of my work and let me know what you think! This is a very touching comment that ercolano wrote about one of my pieces. "Your work is obviously intellectual, deliberately cryptic, its provocatively challenging and perhaps a tad smug (and I use that complimentary) perhaps hopeful, but doubtful, that some can interpret the true meaning, or maybe its even designed to have them interpret it how they will. Nothing is as it seems, subtle metaphors designed to hint just a bit, others to throw you off, but all I can say that this had me thinking of insects, mosquitoes, flies, the habitat of a rare species of bird, protected lands, I think on my first read I even thought about the Amish, Mormons... alligators. Your work is very interesting, and requires some thought."